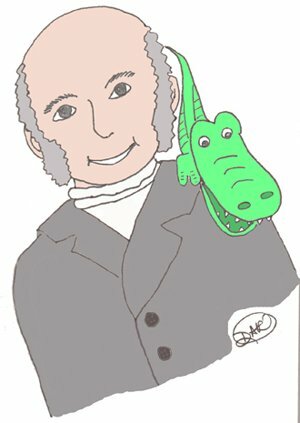 Welcome to this John Quincy Adams poem, The President and the Alligator, by Denise Rodgers. And follow-up with White House fame. With 'gator kept in residence. The first to take a daily swim. Decided once again to run. He found he simply could not stop. He served his country till he died. John Quincy Adams served as Secretary of State under President James Monroe. He certainly had sufficient experience, having previously served as Minister to the Netherlands, Prussia, Russia, and Great Britain. From 1831 till 1848, John Quincy Adams was elected and served nine consecutive terms in Congress as a representative of his home state of Massachusetts. He had a stroke and collapsed while on the floor of the House, and died two days later in the Speaker's office. His old friend, Marquise de Lafayette, came from France to visit, with the gift of an alligator. Adams was the first president to enjoy the company of this scaly pet, which he kept in the East Room of the White House (where his mother and servants did the laundry when he was a child.) It wasn't until Herbert Hoover became president that there was a pet 'gator in the White House again! If you enjoyed this John Quincy Adams poem, please go to the US Presidents page for a selection of poems about every president of the United States. For more John Quincy Adams facts, go to WhiteHouse.gov.